Francisco de Zurbarán was born in Estramadura, Spain in 1598. Francisco's began working with charcoal as a child, drawing various objects. His father apprenticed young Francisco to a Seville artist, Pedro Diaz de Villanueva in 1614. Villaneuva and his work appear to be lost to history. 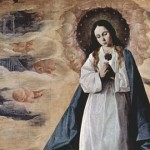 Around 1630, he became the court painter to Philip IV (1605-1665). Philip was King of Castile and Aragon (1621-1665), the King of Portugal until 1640 and reigned as Philip III over Naples and Sicily. Diego Velázquez (1599-1660) is considered to have been the “leading artist in the court of King Philip IV” and he pushed for Philip to award Zurbarán a royal commission. According to Wikipedia, the kind once said of Zurbarán that he was “Painter to the king, king of painters.” So, obviously Philip held Zurbarán in high regard. 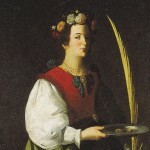 Zurbarán would appear to have been unlucky in love. He married Maria Paez in 1617. She died within a few months of having their given birth to their third child in 1623. Beatriz de Morales, would become his second wife in 1625. She died in 1639. Her death would appear to have caused a decline in his work. 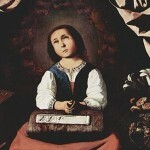 After 1640, Zurbarán's reputation began to decline. He married Leonor de Tordera in 1644. All three of his wives were wealthy widows when he married them. His paintings were seen as austere, harsh and hard edged and unfavorably compared to Bartolemé Esteban Murillo (1617-1682). Art was becoming more cheerful and realistic. The collapse of the Spanish economy hurt many of his main patrons and they were unable or unwilling to spend their money with Zurbarán. 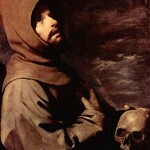 Stylistically, Zurbarán is most often linked to Caravaggio and often referred to as the Spanish Caravaggio. He adopted Caravaggio's realist use of chiaroscuro and tenebrism. 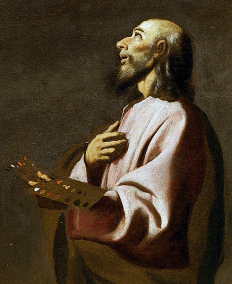 Juan Sánchez Cotán also is thought to influence Zurbarán's work along with a sculptor named Juan Martínez Montañés. His principle students were Bernabé de Ayala and the Polanco brothers.